The disciples asked Jesus, "Where do you want us to get ready to eat the Passover meal?" Jesus answered them in a strange way. He said, "Go into the city and you will find a certain man there. Tell him that the Master says that his time is at hand. Tell him that the Master wants to keep the Passover with his disciples at his house. The man will understand." Peter and John followed the man to a house. Then they talked to the owner of the house about a room for the supper. They said that the Master wanted to eat the Passover there. He showed them a large upper room. The room was furnished and they began to get everything ready for the Passover Feast. Then Peter and John waited for Jesus and the other disciples. As they ate the meal, Jesus told about the things that were about to happen. He blessed the bread and broke it. Then he gave it to them. He said," Take, eat, this is my body." He gave thanks for the drink in the cup. He said, "This is my blood which is shed for you. 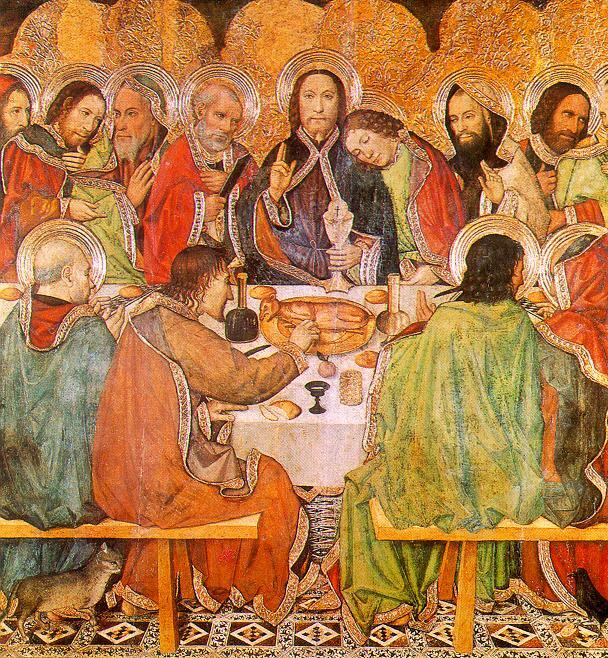 Not long after Jesus and his disciples ate the Passover supper together, one of the disciples, Judas Iscariot, betrayed him to the priests and rulers of the Temple. These men had been looking for a chance to arrest him. Jesus knew this would happen. In fact, he had told the disciples that he would be betrayed by one of them. Jesus had told the disciples that he would leave them, that he would be put to death, and that he was going back to live with the Father. He had also had told them the Father would send another helper to them, the Holy Spirit. But the disciples did not fully understand what he was saying. After Jesus and the disciples left the room where they had eaten the Passover supper, they went to the Mount of Olives and into the Garden of Gethsemane. 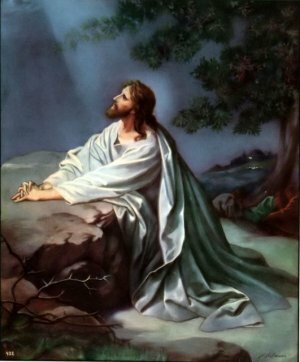 Jesus asked the disciples to wait, and he went farther into the garden to pray. Judas had left earlier by himself. After some time, Jesus came back to the disciples who had gone to sleep. He was very sad and he went to pray three times, but the disciples were too tired to stay awake. He woke them up, and as they were talking, Judas came up to them. He was with some of the rulers from the Temple. Judas when he saw Jesus, ran ahead and kissed him. This was the signal to the soldiers to identify Jesus. The soldiers who were there came to take Jesus. Peter at first wanted to fight, but Jesus told him, "No." Jesus agreed to go with the men. The soldiers took Jesus to Caiaphas, the high priest. There he had a trial. The priests and rulers agreed that he was guilty of claiming to be God's son. They did not believe that he was. They agreed that he should be put to death. Under the Roman law, however, the Jewish leaders could not condemn a person to death. 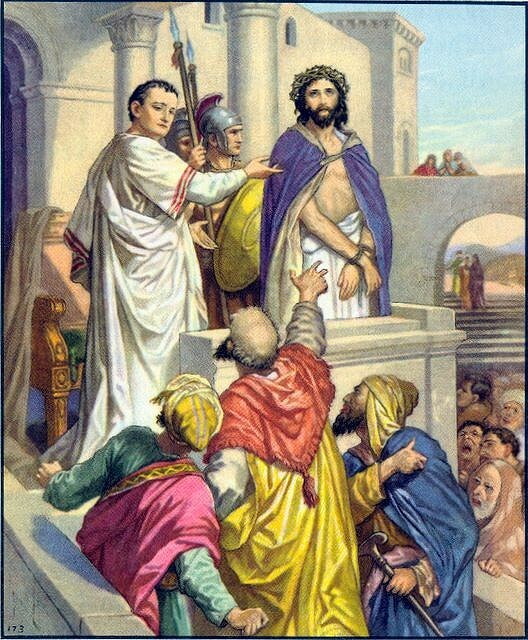 So the Jewish leaders took Jesus to Pilate, the Roman governor. 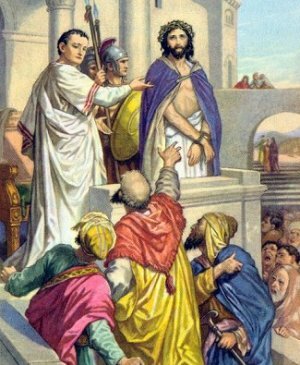 Pilate could find no reason for putting Jesus to death, but after a long time, he told the Jewish rulers to do what they wanted to do with Jesus. The soldiers made fun of Jesus. They called him a king, but they didn't believe that he was. They put a crown of thorns on his head and a staff in his hand. They put a scarlet (red) robe on him and spit on him. And they whipped him. 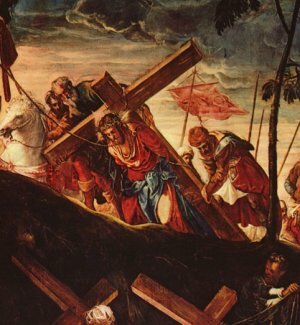 The soldiers took Jesus away to a hill called Golgotha or Calvary. 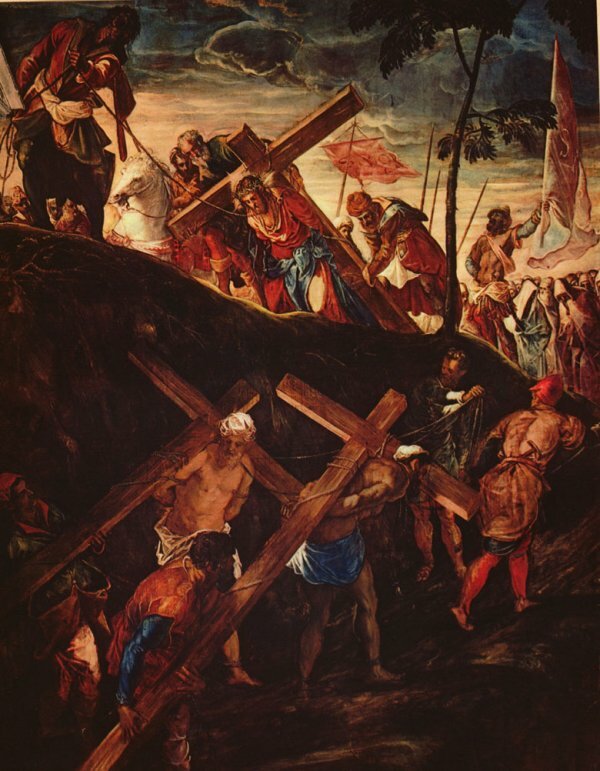 There they crucified him and put him to death on a wooden cross. But even while he was on the cross, he forgave those who were crucifying him. He said, "Father, forgive them. They don't know what they are doing." It was during this time that some people came to know that he was the Son of God. One of these was a thief who was being crucified on a cross next to Jesus. Another who believed was a Roman soldier who was watching. There was a great earthquake. When the soldier heard the earthquake and saw the things that were happening, he became afraid and said, "Truly this was the Son of God!" When Jesus died, the thick curtain in the Temple was torn apart. It ripped from the top to the bottom. This curtain had separated two rooms. In one room only the high priest could go, and in the other room, others could go. When Jesus died, he made it possible for all people to go to God and worship him without anyone else in between. Jesus is now our high priest. Jesus suffered terribly in order to save us. During that time of suffering He sets an example for us to show us how we should treat people. He asked God to forgive those who were torturing and killing Him. In view of what He has done for us, how can we refuse to forgive others? It is unthinkable that we should be unwilling to forgive a wrong done to us. Maybe someone has hurt your feelings, but they haven't nailed you to a cross, have they? The Bible teaches us that we will be forgiven in direct relation to how we forgive others. This is really a serious thought. Do we want forgiveness from God? Then we need to develop a forgiving spirit toward others. English Bible Activities Select from stories #229-237 in the list for activities to accompany this Bible story. Spanish Bible Activities Select from stories #229-237 in the list for activities to accompany this Bible story. Press "Go" to search for books about The Crucifixion. Very good site for teaching children. Appreciate your efforts. One comment, we know that these are real incidents that happened. Not a story. So it would be nice if you can change "What does this story mean to me?" to something like "What these incidents has to do with me?" This page displayed 282,216 times.